Thanks to my last post, we found our puppy, 6 weeks ahead of schedule. Friends saw what I’d written and suggested I contact a breeder of something called Australian Labradoodles, just over the border in NY–very near our beloved Falcon Ridge Folk Festival. I spoke with the breeder the next morning, and sure enough, he had a litter of pups, and the smallest one was still unclaimed. “The litter was born on November 8,” the breeder said. “So that’s what I was doing that night.” Our silver lining pup. My daughter and I went on a dog tour of the neighborhood, visiting Doodles of all shapes and sizes, including two who came from this particular breeder. I think Doodles must be the official dog of Northampton MA. Now that I know what they look like, I see them everywhere. The kids and I drove out there on the second to last day of December. Already, I was feeling better. 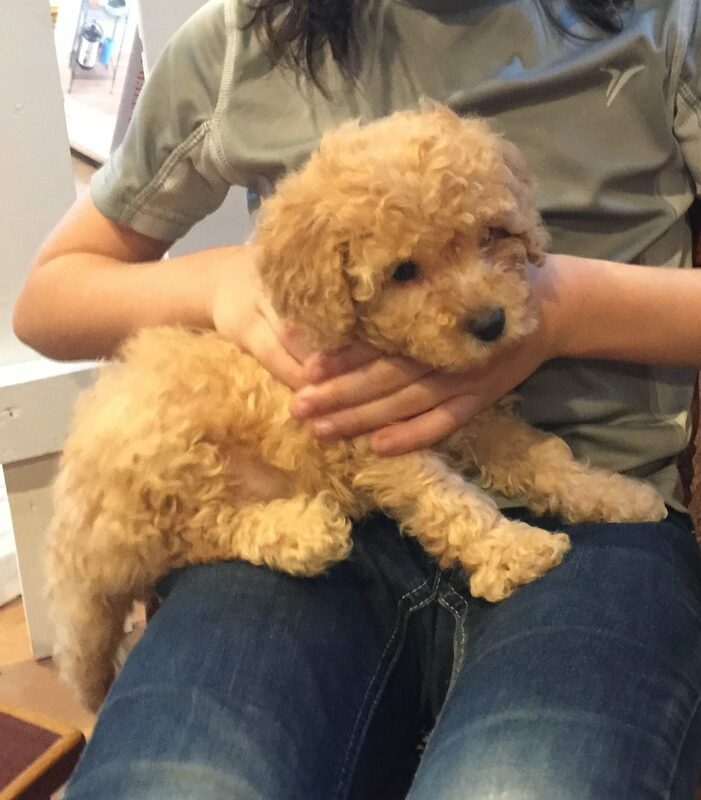 We’d seen photos, but I wanted to hold that little guy–an Australian Labradoodle who wouldn’t grow to be more than 20 lbs. We found the place way out in the middle of nowhere. It’s a stand-alone tiny clapboard called the Puppy Pagoda, and inside were about twelve pups and several fully grown dogs, and a wonderful singer/songwriter/journalist turned dog breeder named Curtis. 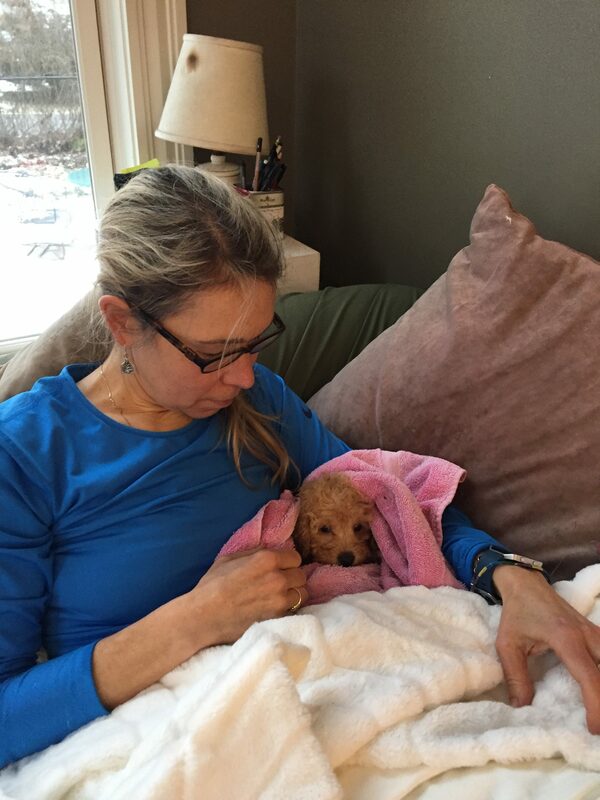 I liked and trusted him immediately, and when the tiny cinnamon-colored pup was placed in my kids’ arms, I knew we’d come to the right place. The kids were sure. They named him Hudson, and a week later I returned with my friend Rosie and her 9-week-old puppy Tallulah and we brought Hudson home. We almost named him Haji, because he looks exactly like a stuffed animal Katryna had when she was a little girl. She’d named the stuffie Haji after a character on I Dream Of Jeannie. Haji, upon further investigation (Wikipedia), was the most powerful and evil genie of all Baghdad. It’s also a slur. (What an enlightened show that was! Where to even begin???) I felt sad about dropping the name, because I love its original meaning–a pilgrim to Mecca. I felt like finding this wonderful little dog was the culmination of my own haj. But it just wasn’t OK for a WASPY American like me to name a dog Haji. So we went back to Hudson. But in between meeting Hudson and his homecoming, I’d made another kind of pilgrimage. 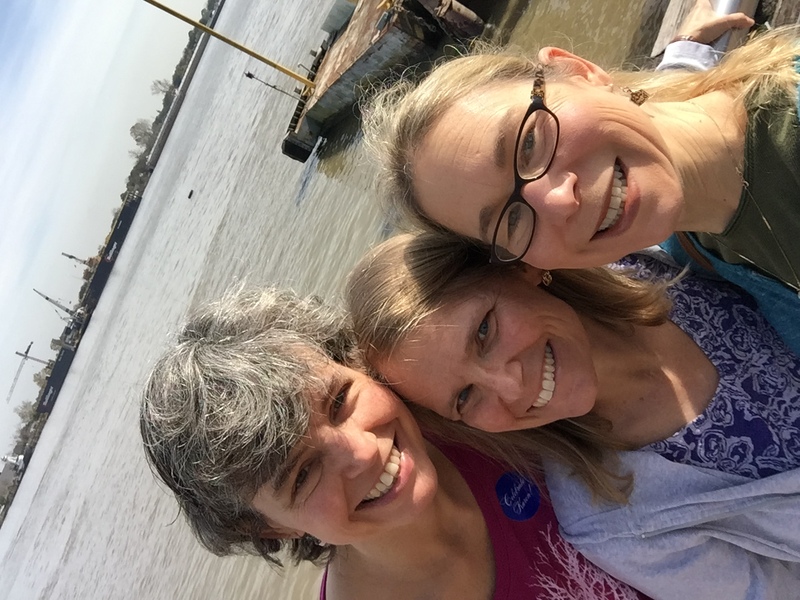 My best college buddy’s husband flew me and her other bestie down to New Orleans for her 50th birthday–a surprise. 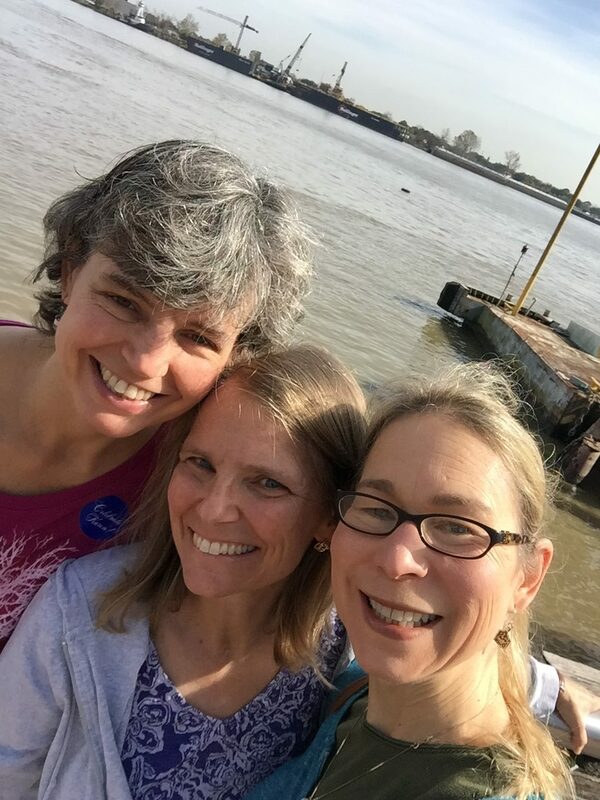 For 36 wonderful hours, I was immersed back in my college world, only better–three women who were all approaching a half century of life, with some scars but mostly boatloads of gratitude and amazement. 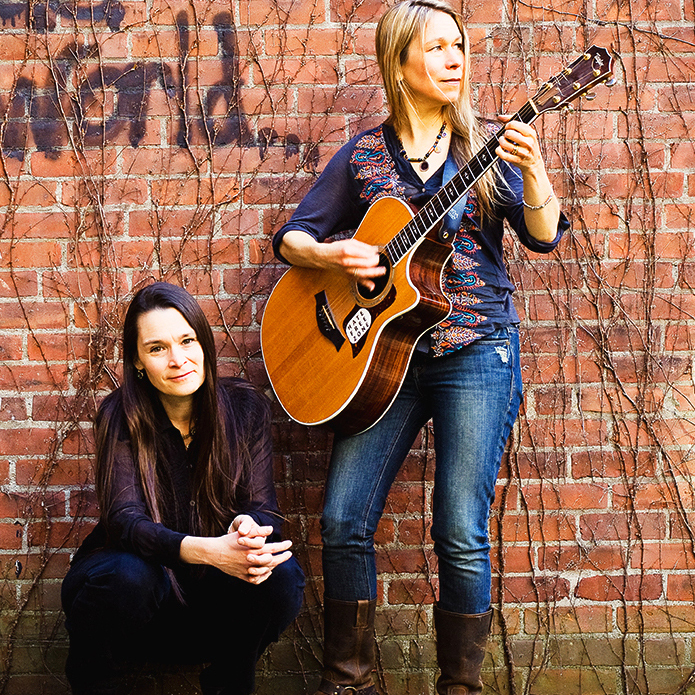 We may as well have been in North Dakota–we holed up in a hotel room and hung out in our pjs, staying up late to talk, read each other poetry, sang, did yoga and meditated together. It was grounding and reorienting and a great way to begin the new year. This new year feels like a fresh burn that you try not to touch, but sometimes it hurts without any external stimulus. The older I get, the less I realize I know. Or maybe what I mean is, the older I get, the more I understand that what I do know is minuscule, and becomes more so with each passing year. And as the year turns and we approach this new epoch, what I have taken to calling the New Reality, I have a clear focus. I might not know what the future will bring to our country, or what kind of a record I am supposed to write next, or whether my novel will get published, or whether my kids will have terrifying problems as teenagers, or if my parents will get sick, or who we will lose this year. I don’t know what is right for my friends to do. I don’t have answers anymore, or solutions, or even any really good ideas. But I do know that when my little dog squirms I should take him out to pee. I know that when he falls asleep next to me, I feel at perfect peace. I know that the look on my son’s face when Hudson follows him around is worth any amount of money. I know that it’s possible my daughter’s deep happiness at finally having her own dog might just be what I was put on earth to do. I keep saying, what are we for if not for this? What can we do? Write a poem. Plant a garden. Have a baby. Reconnect with an old friend. And whenever possible, protect the vulnerable, speak out against injustice and, of course, sing. Glad you found the dog you& your kids wanted, Nerissa! I hope it is a great year for you and Katryna and all your family. Looking forward to your novel, and any recordings. Your singing always makes the world of my experience a better place. Ignoring her advice was the best possible thing for both of you–didn’t you always pick your kids up as little ones? Same thing; your puppy isn’t going to be left alone in an apartment in a crate for all his days, so why do it on his first night?? For the sleeping thing (and, really, any time we could not be there with him), we used a Snuggle Puppy. Worked like a charm! Your puppy is beautiful. Congratulations! Our family has been looking for a dog. We love labs & goldens but I think they are just too big for us. Where did you get your puppy? I would love to go somewhere that is trustworthy. My wife and I and our 7 year old daughter (Molly) love your music. We really enjoyed the show at the Iron Horse last night! Peace to you and thank you for a wonderful evening last night! !